Cambridge Audio seeks Beta testers for its forthcoming NP30 network music player | What Hi-Fi? 1) It's a 24bit UPnP network client. The NP30 can connect to UPnP servers on a network and browse and playback up to 24bit/96kHz (plus MP3, AAC , FLAC, WMA and other popular formats) music content stored on a computer or NAS drive. 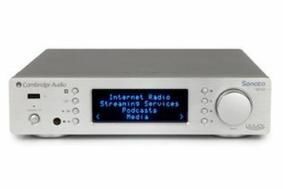 2) It's an internet radio, allowing playback of over 15,000 internet radio stations through your hi-fi. 3) It's a way to play your favourite streaming services through your hi-fi. Rather than having to play the streaming service through your computer and then rig up an audio connection to your hi-fi, you can play it directly through the NP30. 4) It's a local media player. The NP30 supports local media from USB Flash disks or USB hard-drives and has two USB2.0 ports for this purpose, allowing you to play up to 24bit/96kHz audio files from an attached USB drive. Before Cambridge Audio launches the NP30 it's assembling a Beta test group to help evaluate it in real world conditions. The company would like to invite What Hi-Fi? Sound and Vision visitors and readers to join the panel. If you are invited to join the Beta test panel – based on a carefully considered criterion – you'll be asked to thoroughly evaluate the NP30 in your own home, using your own hi-fi system. A simple questionnaire will be provided for you to give CA your thoughts and feedback – good or bad! If this sounds interesting to you and you'd like to get to grips with a piece of hot new technology before it goes on sale, please take two minutes to complete the preliminary survey by clicking here. Testing will take place in late July/early August and Cambridge Audio will get in touch with the people it chooses to join the Beta test panel by mid July to make the necessary arrangements.